yRead will load a plain text, HTML or RTF file and display it in a single-column, resizable window. Then it will read the file to you out loud, using human speech. You can even get voices for other languages. Use it to listen to ebooks, your own writing or any other piece of text. yRead now includes a catalogue screen for the online Gutenberg archive - it will retrieve the latest catalogue, show you a sorted list of all titles. ...... titles and allow you to pick, download and listen to any of them. yRead includes a translation table (see the help file). This enables you to build a series of phonetic spellings so that mis-pronounced words will come out correctly. This is a fairly dumb string replace, so if you replace 'e' with 'x' you'll havx to livx with the consxquxncxs. 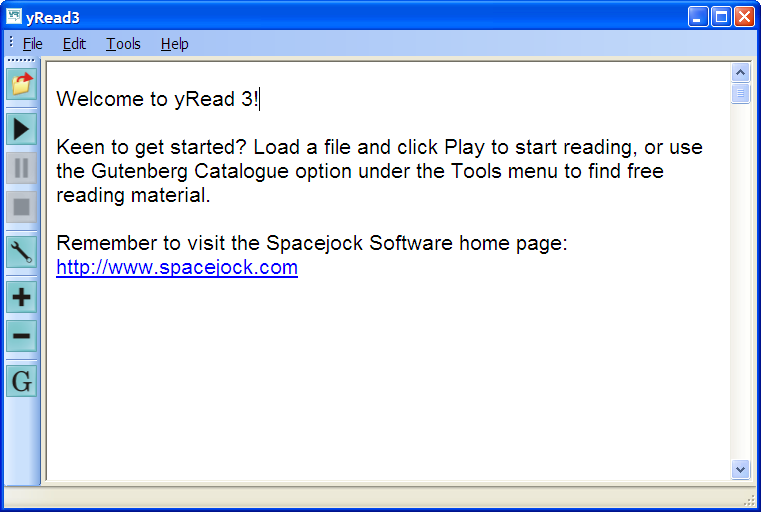 yRead3 is free software from the author of the Hal Spacejock series. Qweas is providing links to yRead3 3.0.0.9 as a courtesy, and makes no representations regarding yRead3 or any other applications or any information related thereto. Any questions, complaints or claims regarding this application yRead3 3.0.0.9 must be directed to the appropriate software vendor. You may click the publisher link of yRead3 on the top of this page to get more details about the vendor.